The index opened flat to positive and after making an initial low around 8581 saw some short covering to close at 8638.00, gain of 22.75 points. The broader market was positive with 982 advances to 656 declines. Range at the start of series at 8500-9000. Call option 8500-9200 added 20.90 lacs OI with short covering at 8200 and below strike prices. 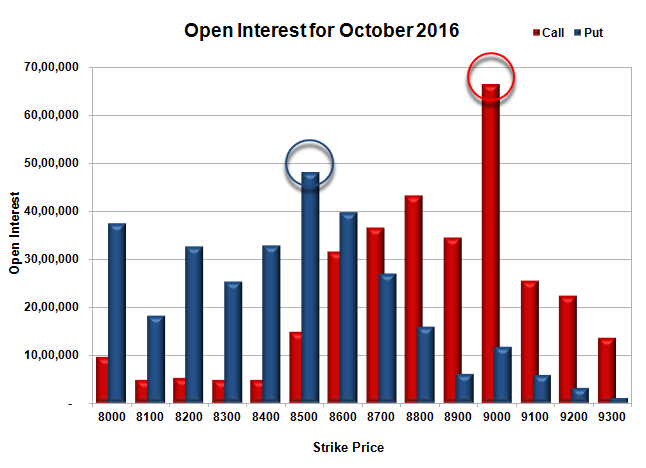 Put option 8700-8000 added 27.99 lacs OI with short covering at 9100 and above strike prices. 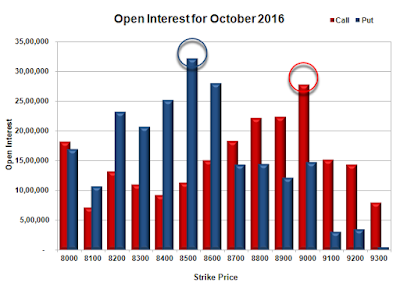 Nifty Open Interest is at 1,77,32,100 down by 2,32,575 with increase in price, probably short covering. Bank Nifty Open Interest is at 15,35,560 down by 24,160 with increase in price, probably short covering. 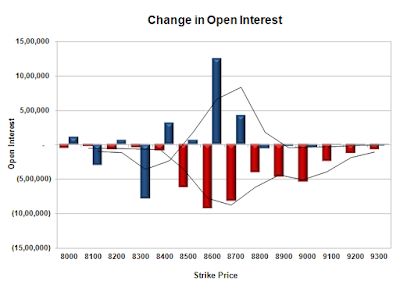 FII’s sold 17089 contracts of Index Futures, which includes net 8291 contracts long liquidation and 8798 contracts short build-up, with increase in net OI by 507 contracts, includes 17643 longs to 34732 shorts for the day. FII’s Index future open contract as on date is 154986 Longs to 51554 Shorts, Net long 103432 contracts. Initial support at 8600 with OI of 34.13 lacs and below that at 8500 with highest OI of 40.50 lacs. Initial resistance at 8700 with OI of 21.92 lacs and above that at 8800 with OI of 23.95 lacs. Day Range as per Option Table is 8570 - 8686 and as per VIX is 8572 - 8704 with 8628 as the Pivot. The index opened flat and went down to touch the lows at 8550, but support level buying saw the index close flat at 8615.25. The broader market was weak with 545 advances to 1086 declines. Range at the start of series at 8500-9000. Call option 8200-9000 added 32.78 lacs OI with profit booking at 9100 and above strike prices. Put option 9000-8000 added 46.37 lacs OI. Nifty Open Interest is at 1,79,64,675 up by 56,68,800 with no change in price, probably 100% roll-over with huge long/short build-up. Bank Nifty Open Interest is at 15,59,720 up by 5,08,360 with increase in price, probably 100% roll-over with huge long build-up. FII’s bought 12615 contracts of Index Futures, which includes net 30938 contracts long liquidation and 53817 contracts short covering, with decrease in net OI by 84755 contracts, includes 81112 longs to 68497 shorts for the day. FII’s Index future open contract as on date is 163277 Longs to 42756 Shorts, Net long 120521 contracts. Initial support at 8500 with OI of 28.01 lacs and below that at 8500 with highest OI of 32.15 lacs. 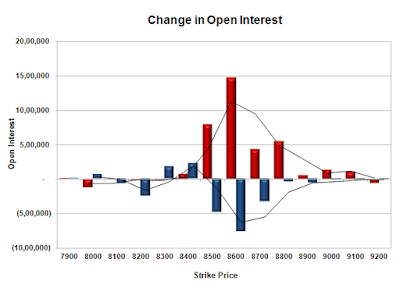 Initial resistance at 8700 with OI of 18.30 lacs and above that at 8800 with OI of 22.20 lacs. Day Range as per Option Table is 8543 - 8665 and as per VIX is 8552 - 8679 with 8597 as the Pivot. The index opened weak and stayed weak for the entire session of trade to close near the lows at 8615.25, loss of 76.05 points. The broader market was weak with 542 advances to 1099 declines. Expiry Range is at 8500-8700. Call option 8600-8800 added 34.53 lacs OI with profit booking at 8900 and above strike prices. 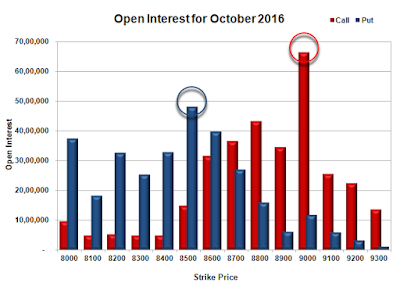 Put option 8550 added 8.19 lacs OI with short covering at 8600 and above strike prices. Nifty Open Interest is at 1,23,74,400 down by 16,54,425 whereas Nov series added 34.77 lacs OI with decrease in price, probably 100% roll-over with huge short build-up. Bank Nifty Open Interest is at 11,96,000 down by 5,04,320 whereas Nov series added 2.70 lacs OI with decrease in price, small roll-over with huge long liquidation. 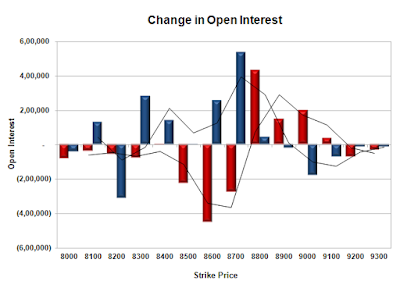 FII’s sold 4751 contracts of Index Futures, which includes net 3887 contracts long build-up and 8638 contracts short build-up, with increase in net OI by 12525 contracts, includes 91880 longs to 96631 shorts for the day. FII’s Index future open contract as on date is 194215 Longs to 96573 Shorts, Net long 97642 contracts. Initial and best support at 8500 with OI of 50.79 lacs and below that at 8400 with OI of 35.97 lacs. Initial resistance at 8650 with huge OI addition of 14.88 lacs and above that at 8700 with OI of 51.72 lacs. 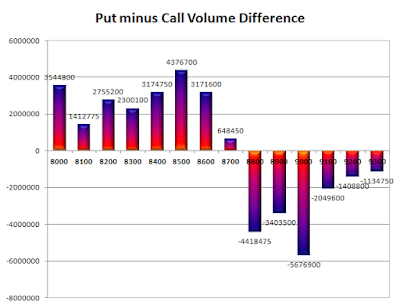 Day Range as per Option Table is 8561 - 8680 and as per VIX is 8550 - 8680 with 8623 as the Pivot. The index opened positive but was unable to sustain the highs and went on to the lows around 8663.45 but closed a bit higher at 8691.30, loss of 17.65 points. The broader market was negative with 679 advances to 952 declines. Range stays at 8500-8800. Call option 8700-8900 added 9.66 lacs OI with profit booking at 9000 and above strike prices. 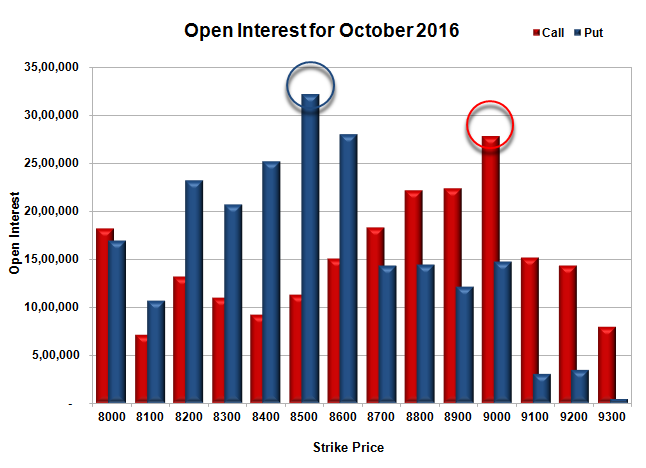 Put option 8500-8400 added 2.02 lacs OI with short covering at 8700 and above strike prices. Nifty Open Interest is at 1,40,28,825 down by 25,69,200 whereas Nov series added 34.44 lacs OI with decrease in price, probably 100% roll-over with huge long liquidation. 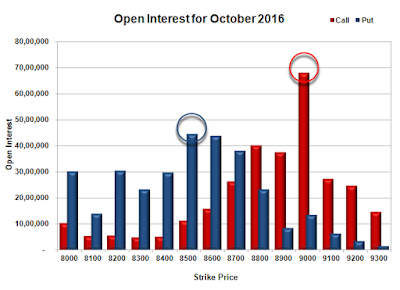 Bank Nifty Open Interest is at 17,00,320 down by 1,21,720 whereas Nov series added 3.30 lacs OI with increase in price, probably 100% roll-over with huge long build-up. FII’s sold 11678 contracts of Index Futures, which includes net 3609 contracts long liquidation and 8069 contracts short build-up, with increase in net OI by 4460 contracts, includes 99004 longs to 110682 shorts for the day. 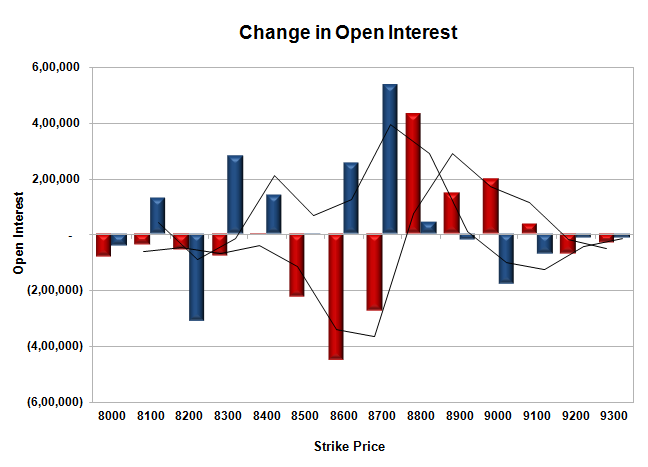 FII’s Index future open contract as on date is 190328 Longs to 87935 Shorts, Net long 102393 contracts. 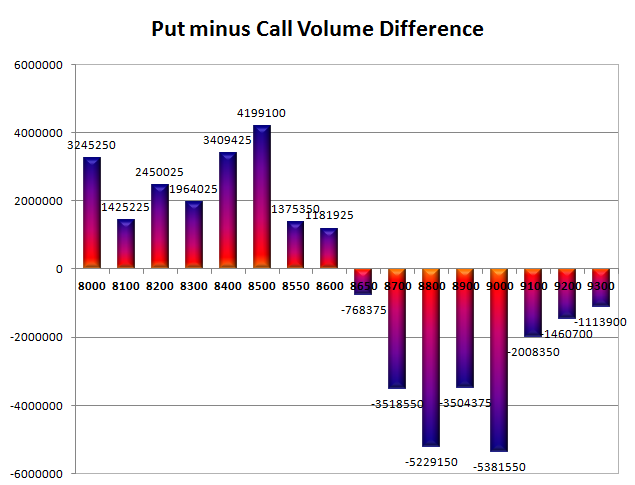 Initial and best support at 8600 with OI of 56.07 lacs and below that at 8500 with OI of 54.04 lacs. Initial resistance at 8800 with OI of 59.49 lacs and above that at 8900 with OI of 42.26 lacs. 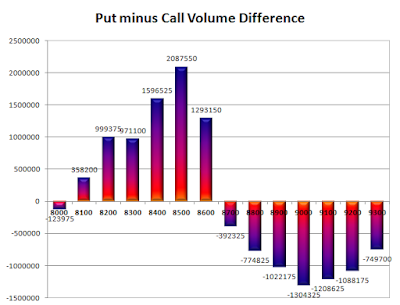 Day Range as per Option Table is 8633 - 8752 and as per VIX is 8625 - 8757 with 8692 as the Pivot. The index opened positive and stayed positive making a high of 8736.95 but closed a DOJI at 8708.95, gain of 15.90 points. The broader market was positive with 936 advances to 701 declines. Range stays at 8500-8800. Call option 8800-9100 added 8.15 lacs OI with short covering at 8700 and below strike prices. Put option 8700-8300 added 12.13 lacs OI with profit booking at 8200 and below strike prices. Nifty Open Interest is at 1,65,98,025 down by 16,30,125 whereas Nov series added 19.15 lacs OI with increase in price, probably 100% roll-over with huge long build-up. Bank Nifty Open Interest is at 18,22,040 down by 20,440 whereas Nov series added 1.44 lacs OI with increase in price, probably 100% roll-over with huge long build-up. FII’s sold 2704 contracts of Index Futures, which includes net 8969 contracts long build-up and 6265 contracts short build-up, with increase in net OI by 15234 contracts, includes 46191 longs to 43487 shorts for the day. FII’s Index future open contract as on date is 193937 Longs to 79866 Shorts, Net long 114071 contracts. 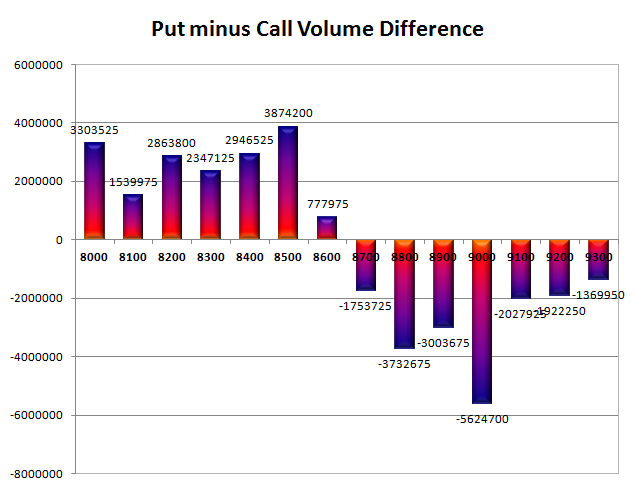 Initial and best support at 8600 with OI of 57.62 lacs and below that at 8500 with OI of 53.27 lacs. Initial resistance at 8800 with OI of 58.45 lacs and above that at 8900 with OI of 38.11 lacs. Day Range as per Option Table is 8648 - 8772 and as per VIX is 8644 - 8774 with 8710 as the Pivot. The index opened positive but profit booking saw the index dip towards 8650 but close flat at 8693.05, loss of 6.35 points. The broader market was positive with 840 advances to 804 declines. Range stays at 8500-8800. Call option 8800-8900 added 4.49 lacs OI with short covering at 8700 and below strike prices. Put option 8700, 8400-8300 added 4.39 lacs OI with profit booking at 8200 and below strike prices. Nifty Open Interest is at 1,82,28,150 down by 3,90,225 whereas Nov series added 4.68 lacs OI with no change in price, probably 100% roll-over with long build-up. Bank Nifty Open Interest is at 18,42,480 down by 53,600 whereas Nov series added 0.37 lacs OI with increase in price, probably long roll-over with short covering. FII’s bought 872 contracts of Index Futures, which includes net 618 contracts long build-up and 254 contracts short covering, with increase in net OI by 364 contracts, includes 16477 longs to 15605 shorts for the day. FII’s Index future open contract as on date is 184968 Longs to 73601 Shorts, Net long 111367 contracts. Initial and best support at 8600 with OI of 55.05 lacs and below that at 8500 with OI of 53.30 lacs. Initial resistance at 8800 with OI of 54.14 lacs and above that at 8900 with OI of 36.61 lacs. 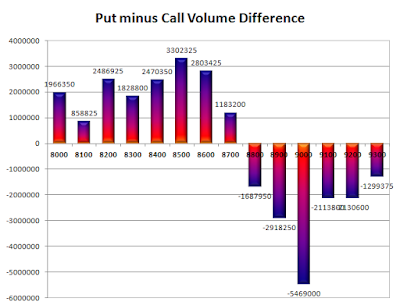 Day Range as per Option Table is 8621 - 8752 and as per VIX is 8630 - 8756 with 8685 as the Pivot. The index opened strong and stayed positive for the entire session of trade and close just shy of 8700 at 8699.40, gain of 40.30 points. The broader market was positive with 961 advances to 682 declines. Range stays at 8500-8800. 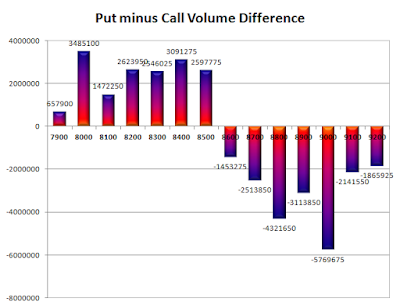 Call option 8700, 9100 added 2.86 lacs OI with short covering at 8600 and below strike prices. Put option 8700-8500 added 19.15 lacs OI with profit booking at 8400 and below strike prices. Nifty Open Interest is at 1,86,18,375 up by 6,45,300 whereas Nov series added 5.12 lacs OI with increase in price, probably long build-up in both series. Bank Nifty Open Interest is at 18,96,080 up by 2,560 whereas Nov series added 0.78 lacs OI with increase in price, probably long build-up in both series. 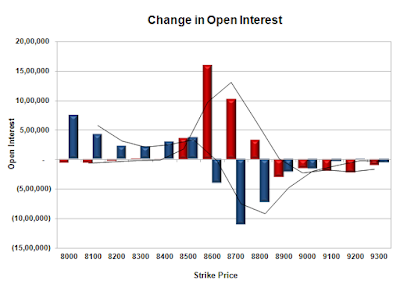 FII’s sold 5396 contracts of Index Futures, which includes net 15356 contracts long build-up and 20752 contracts short build-up, with increase in net OI by 36108 contracts, includes 30478 longs to 35874 shorts for the day. 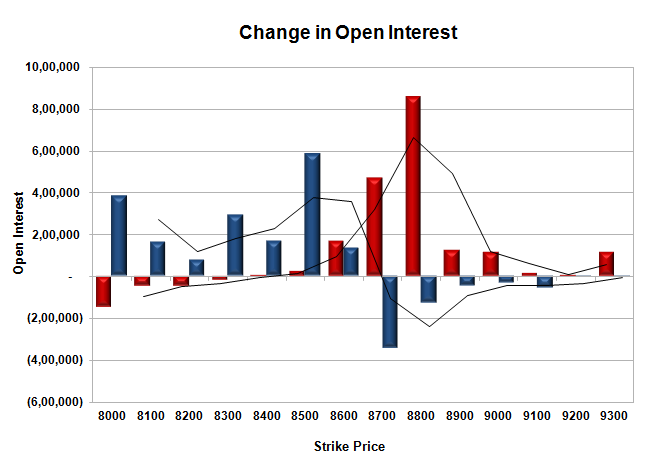 FII’s Index future open contract as on date is 184350 Longs to 73855 Shorts, Net long 110495 contracts. 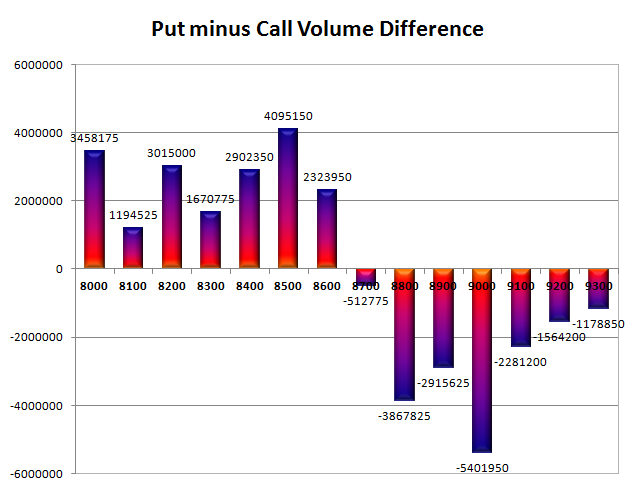 Initial and best support at 8600 with OI of 55.15 lacs and below that at 8500 with OI of 53.88 lacs. 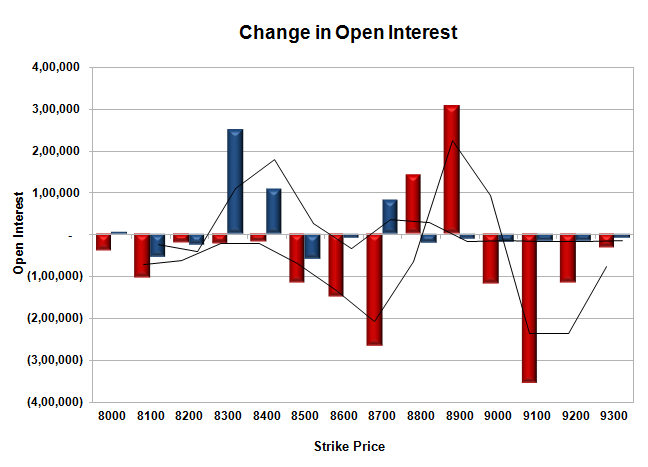 Initial resistance at 8800 with OI of 52.72 lacs and above that at 8900 with OI of 33.54 lacs. 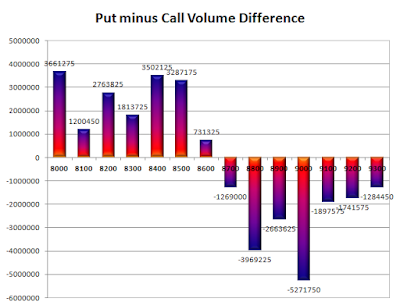 Day Range as per Option Table is 8632 - 8770 and as per VIX is 8635 - 8764 with 8702 as the Pivot. The index opened positive around 8700 but saw profit booking to close weak at 8659.10, loss of 18.80 points. The broader market though was positive with 942 advances to 701 declines. Range stays at 8500-8800. 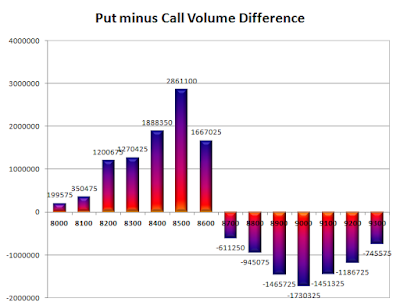 Call option 8700-8900 added 4.85 lacs OI with profit booking at 9000 and above strike prices. Put option 8700-8600 added 4.93 lacs OI with profit booking at 8500 and below strike prices. 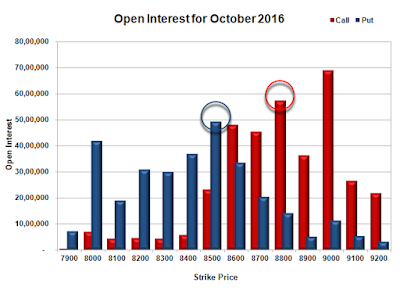 Nifty Open Interest is at 1,79,73,075 down by 4,50,750 with decrease in price, probably long liquidation. 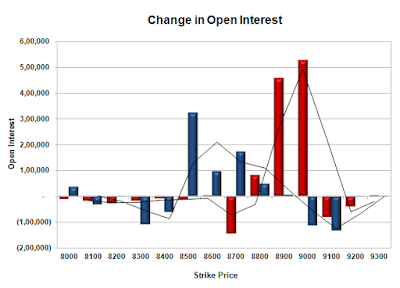 Bank Nifty Open Interest is at 18,93,520 down by 63,640 with decrease in price, probably long liquidation. FII’s sold 1756 contracts of Index Futures, which includes net 625 contracts long liquidation and 1131 contracts short build-up, with increase in net OI by 506 contracts, includes 13843 longs to 15599 shorts for the day. 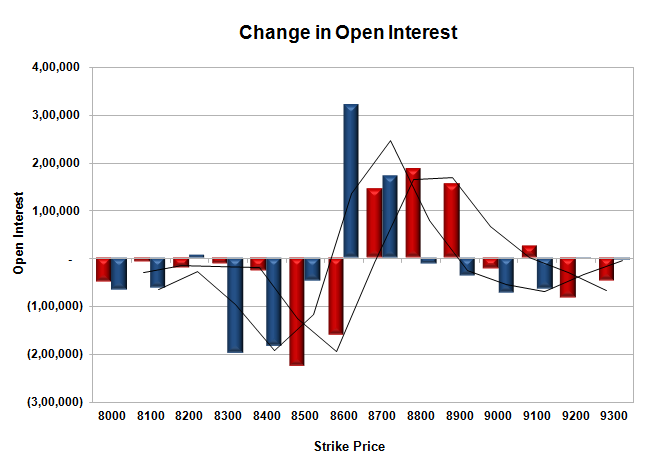 FII’s Index future open contract as on date is 168994 Longs to 53103 Shorts, Net long 115891 contracts. Initial support at 8600 with OI of 49.31 lacs and below that at 8500 with OI of 49.39 lacs. 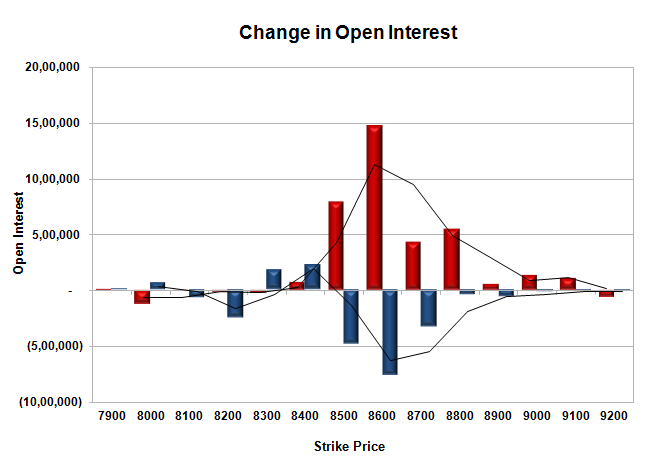 Initial resistance at 8700 with OI of 38.78 lacs and above that at 8800 with OI of 55.18 lacs. Day Range as per Option Table is 8592 - 8734 and as per VIX is 8593 - 8725 with 8665 as the Pivot. The index opened positive and stayed positive for the entire session making new highs with each passing hour to close near the top at 8677.90, huge gain of 157.50 points. The broader market was also strong with 1216 advances to 432 declines. Range now at 8500-8800. 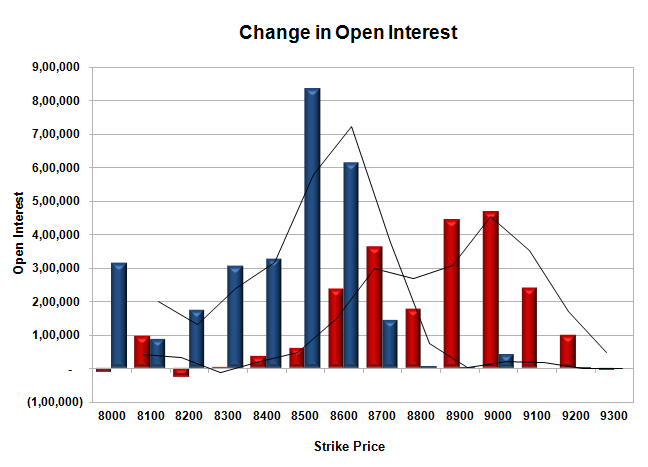 Call did not add any OI with short covering at 8700 and lower strike prices. Put option 8700-8400 added 20.64 lacs OI with profit booking at 8300 and below strike prices. Nifty Open Interest is at 1,84,23,825 down by 3,35,325 with increase in price, probably short covering. 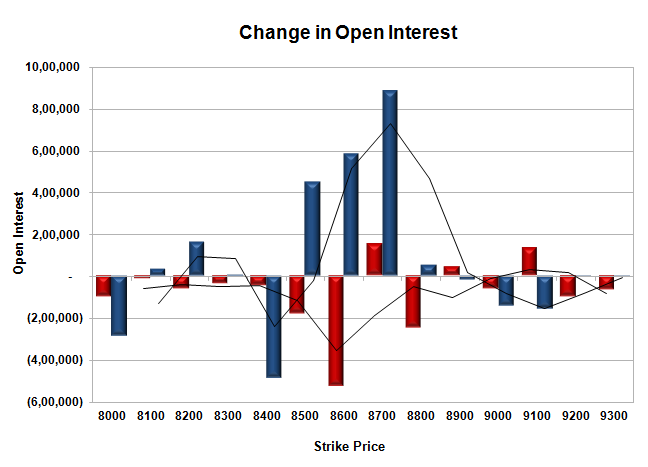 Bank Nifty Open Interest is at 19,57,160 down by 1,90,960 with increase in price, probably short covering. 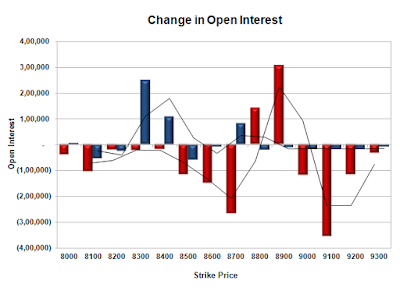 FII’s sold 8930 contracts of Index Futures, which includes net 952 contracts long liquidation and 7978 contracts short build-up, with increase in net OI by 7026 contracts, includes 33350 longs to 42280 shorts for the day. 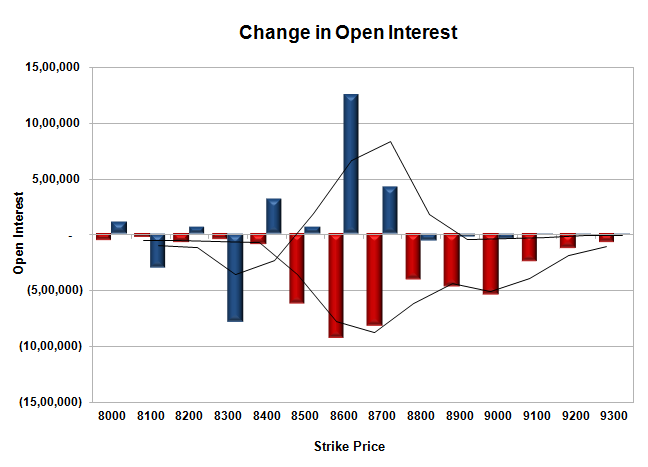 FII’s Index future open contract as on date is 169619 Longs to 51972 Shorts, Net long 117647 contracts. Initial support at 8600 with OI of 46.10 lacs and below that at 8500 with OI of 49.87 lacs. Initial resistance at 8700 with OI of 37.34 lacs and above that at 8800 with OI of 53.31 lacs. 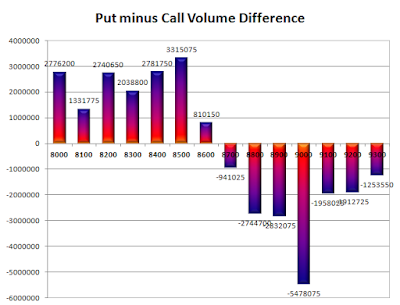 Day Range as per Option Table is 8574 - 8724 and as per VIX is 8612 - 8744 with 8640 as the Pivot. The index opened positive but saw huge selling pressure from the onset to close near the lows at 8520.40, loss of 63.00 points. The broader market was weak with 675 advances to 973 declines. Range has moved lower at 8400-8800. Call option 8500-9100 added huge 35.31 lacs OI with profit booking at 9200 and above strike prices. 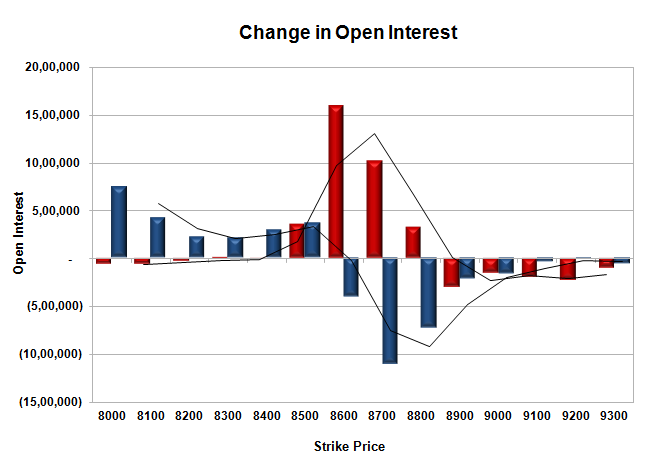 Put option 8400-8300 added 4.00 lacs OI with short covering at 8600 and above strike prices. Nifty Open Interest is at 1,87,59,150 down by 4,86,825 with decrease in price, probably long liquidation. Bank Nifty Open Interest is at 21,48,120 down by 2,00,640 with increase in price, probably short covering. FII’s sold huge 16041 contracts of Index Futures, which includes net 17823 contracts long liquidation and 1782 contracts short covering, with decrease in net OI by 19605 contracts, includes 28573 longs to 44614 shorts for the day. 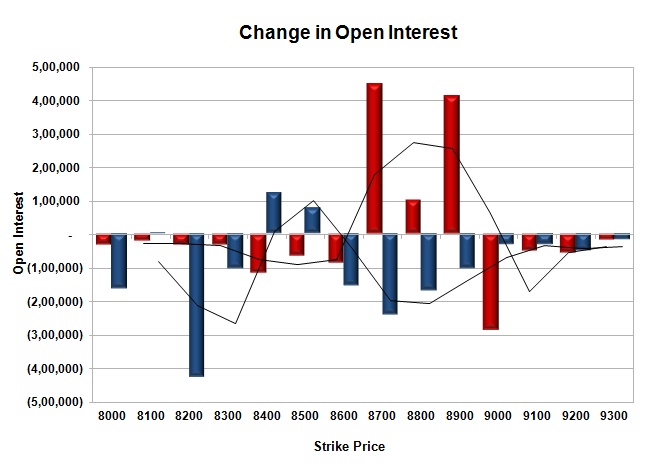 FII’s Index future open contract as on date is 170571 Longs to 43994 Shorts, Net long 126577 contracts. Initial and best support still at 8500 with OI of 49.17 lacs and below that at 8400 with OI of 36.73 lacs. Initial resistance at 8600 with OI of 48.09 lacs and above that at 8700 with OI of 45.54 lacs. 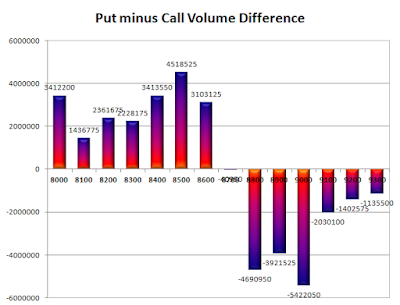 Day Range as per Option Table is 8474 - 8608 and as per VIX is 8451 - 8590 with 8547 as the Pivot. The index opened flat to positive and stayed in a narrow range and closed just in green at 8583.40, gain of 10.05 points. The broader market was strong with 1037 advances to 575 declines. Range stays at 8500-9000. Call option 8600-9300 added 18.68 lacs OI with short covering at 8300 and below strike prices. Put option 8600-8000 added 18.05 lacs OI with short covering at 8700 and above strike prices. 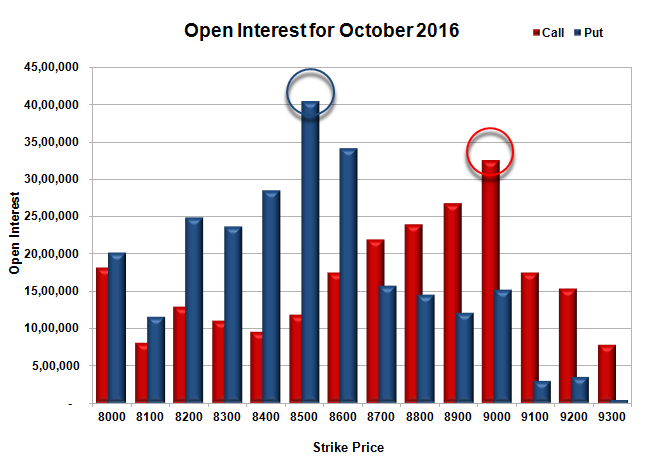 Nifty Open Interest is at 1,92,45,975 down by 5,57,175 with increase in price, probably short covering. 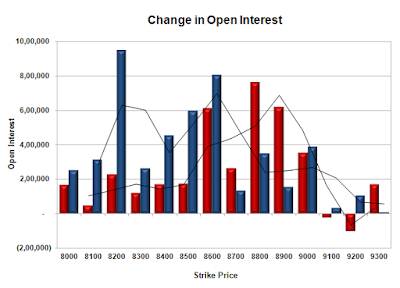 Bank Nifty Open Interest is at 23,48,760 down by 49,120 with increase in price, probably short covering. 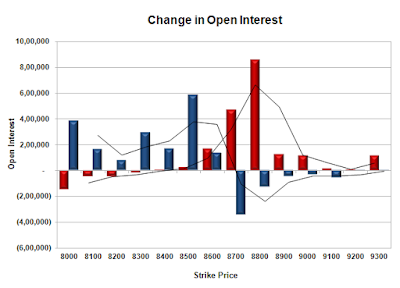 FII’s bought 1103 contracts of Index Futures, which includes net 974 contracts long build-up and 129 contracts short covering, with increase in net OI by 845 contracts, includes 16985 longs to 15882 shorts for the day. FII’s Index future open contract as on date is 188394 Longs to 45776 Shorts, Net long 142618 contracts. Initial and best support at 8500 with OI of 54.01 lacs and below that at 8400 with OI of 34.51 lacs. Initial resistance at 8700 with OI of 41.22 lacs and above that at 8800 with OI of 51.91 lacs. Day Range as per Option Table is 8516 - 8648 and as per VIX is 8517 - 8650 with 8579 as the Pivot. The index opened weak and stayed weak for the entire session breaking one support after another to close near the lows at 8573.35, huge loss of 135.45 points. The broader market was weak with 352 advances to 1293 declines. Range stays at 8500-9000. Call option 8500-8800 added huge 32.97 lacs OI with profit booking at 8900 and above strike prices. 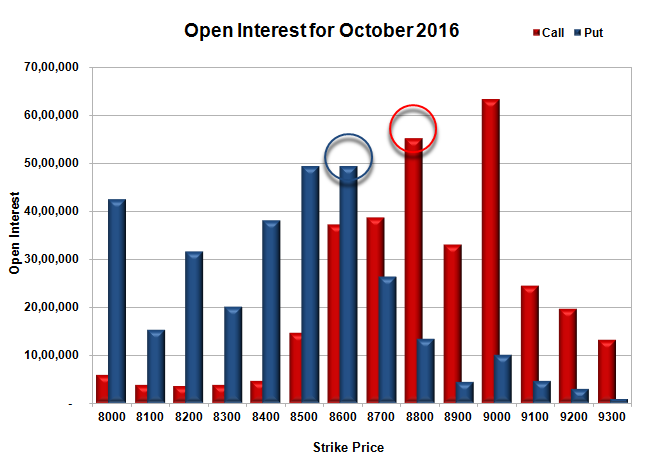 Put option 8500-8000 added 22.69 lacs OI with short covering at 8600 and above strike prices. 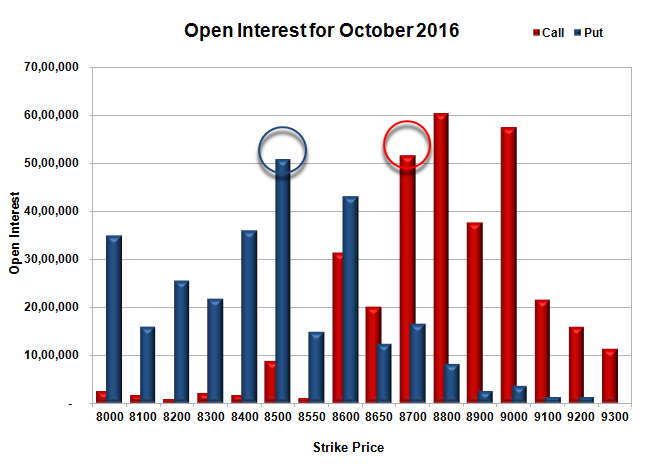 Nifty Open Interest is at 1,98,03,150 down by 14,36,925 with decrease in price, probably huge long liquidation. 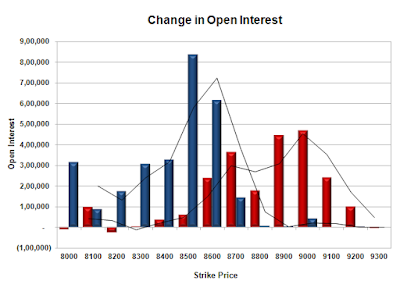 Bank Nifty Open Interest is at 23,97,880 up by 2,60,880 with decrease in price, probably huge short build-up. FII’s sold huge 36342 contracts of Index Futures, which includes net 35935 contracts long liquidation and 407 contracts short build-up, with decrease in net OI by 35528 contracts, includes 25543 longs to 61885 shorts for the day. FII’s Index future open contract as on date is 187420 Longs to 45905 Shorts, Net long 141515 contracts. Initial and best support at 8500 with OI of 48.16 lacs and below that at 8400 with OI of 32.80 lacs. 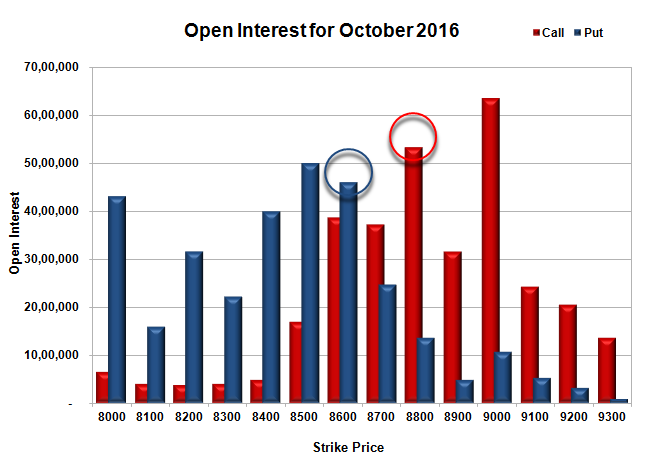 Initial resistance at 8600 with huge OI addition of 15.91 lacs and above that at 8700 with OI of 36.53 lacs. 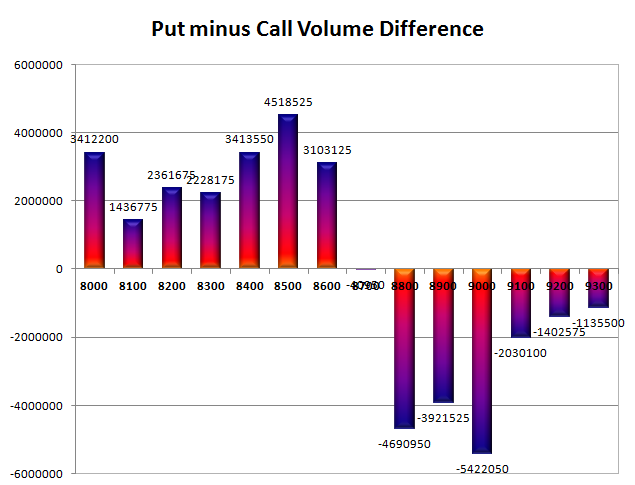 Day Range as per Option Table is 8524 - 8662 and as per VIX is 8504 - 8643 with 8599 as the Pivot. The index opened positive but saw profit booking from higher levels but still closed in green at 8708.80, gain of 11.20 points. The broader market was positive with 952 advances to 685 declines. Range stays at 8500-9000. Call option 8800-9000 added 10.66 lacs OI with profit booking at 9100 and above strike prices. Put option 8700-8500 added 5.90 lacs OI with profit booking at 8400 and below strike prices. Nifty Open Interest is at 2,12,40,075 down by 1,76,250 with increase in price, probably long liquidation. Bank Nifty Open Interest is at 21,37,000 up by 72,040 with decrease in price, probably short build-up. FII’s sold 2322 contracts of Index Futures, which includes net 961 contracts long liquidation and 1361 contracts short build-up, with increase in net OI by 400 contracts, includes 11027 longs to 13349 shorts for the day. 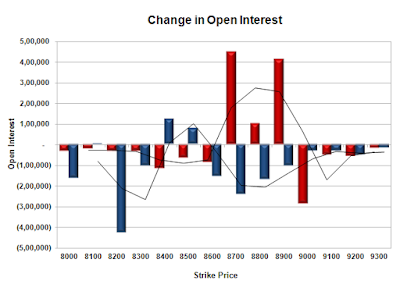 FII’s Index future open contract as on date is 223355 Longs to 45498 Shorts, Net long 177857 contracts. Initial support still at 8700 with OI of 38.14 lacs and below that at 8600 with OI of 43.83 lacs. 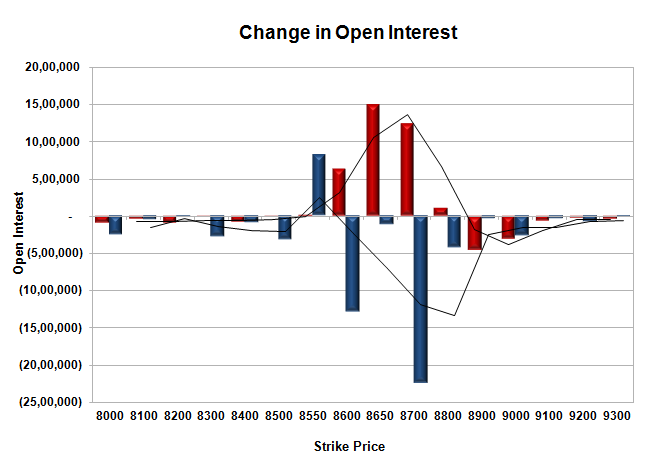 Initial resistance at 8800 with OI of 40.10 lacs and above that at 8900 with OI of 37.57 lacs. Day Range as per Option Table is 8655 - 8781 and as per VIX is 8644 - 8774 with 8720 as the Pivot.